Air elevates the artworks at the colossal "Inflatable" exhibit. "INFLATABLE"? You only need to call upon the science-loving institution to eye the enchanting "Expanding Works of Art." 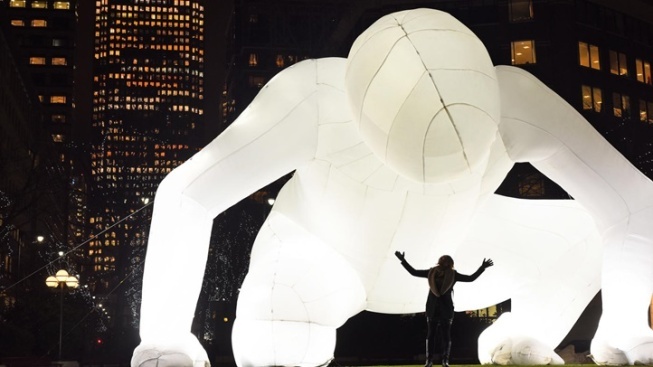 The pieces, like Amanda Parer's "Fantastic Planet," a humongous human-like shape that appears curious and gentle, fill both the outdoor areas near the Exploratorium as well as inside spaces. "(A) forest of cushiony columns" from Jimmy Kuehnle is another wowza addition, but there are several to admire. "Fueled by whimsy and lightness of balloons, the artists of 'Inflatable' have infused their creations with a technology, scale, and creative complexity that expands our vision of what contemporary art can look like," is the spirited statement from the Exploratorium. Inflatable aficionados, be sure to visit these airy and giant gems on or before Sept. 3, 2018.